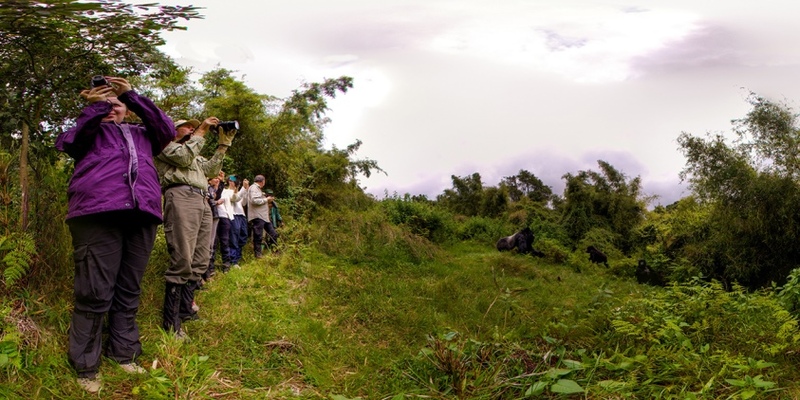 Sidle up to one of our world’s greatest living wonders: a group of mighty mountain gorillas browsing and playing in their natural habitat on Mount Karisimbi, Rwanda. The latest vEcotour from vEcotourism.org (a project of Chimp-n-Sea) features 360 degree images, ambient background sounds, and embedded videos, all captured by our vEco Ambassador and great ape expert, Ian Redmond. Mount Karisimbi, a dormant volcano, is part of the Virunga Mountains which straddle the borders of Rwanda, Uganda and the Democratic Republic of Congo (DRC). Karisimbi is home to diverse wildlife, including a significant population of the critically endangered mountain gorilla, and encompasses a wide variety of vegetation zones including the bamboo forests and hagenia forest which characterise the high-elevation Afromontane regions of central and eastern Africa. Immerse yourself in prime gorilla habitat and, with expert narration from Ian Redmond, experience awesome silverbacks jostling for position, meet the only other nonhuman primate in the National Park and delight in young gorillas frolicking in a bamboo grove. Begin your trek by clicking on the image above!